Breast milk freezer bags make it possible for moms to continue breastfeeding even when they are no longer able to be with their babies all day long to nurse on demand. This is important because breast milk has been aptly called "liquid gold" by mothers who work hard to produce it for their precious newborns. Breast milk is best for your baby for many reasons. First, it contains all the nutrients baby needs in those vital first 6 months of life and scientific studies have continually proved that babies who are exclusively breastfed during this period thrive better than those who are not. Second, breast milk is an incredible immune booster and will protect baby against many diseases that range from respiratory illnesses such as asthma and pneumonia, ear infections, stomach upsets and even meningitis. When moms need to head back to work, they may choose to pump breast milk for their hungry babies to take while they are away. Breast milk freezer bags are the best options for moms who’d like to continue breastfeeding when they are no longer able to be with their babies all day long to nurse them on demand. Many companies offer breast milk freezer bags, but only a few have withstood the test of countless moms and babies to stand out as the industry's leading products. 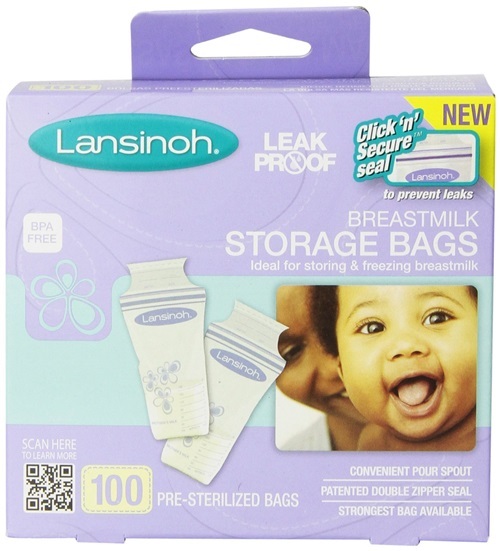 Lansinoh bags have a convenient pour spout and double click and secure seal, and give you double assurance that your precious breast milk won't leak out and go to waste. Measuring marks take the guesswork out of ascertaining how much milk you are freezing. They have a white labeling area where you can write the date and amount of milk expressed and frozen in the bag. When frozen, the bags lie flat to free up more space in your freezer. They are pre-sterilized, are BPA-free and are the largest breast milk freezer bag on the market. So this brand of bags has a lot going for it. With the help of the Medela Freestyle breast pump, these are the ones I used to fill up my 16.7 cu. ft. upright freezer with breast milk when my second son was born. He's a now a healthy, playful and smart 6 year old. If you select the box with a count of 100 Lansinoh bags, you'll pay just $0.16 per bag! That is almost getting America's top selling breast milk freezer bag for almost free! NUK has a leak-proof, double zipper storage bag with a superior oxygen barrier to protect the nutrients in the milk from freezer burn. This milk organizer is a great tool for making sure that the breast milk that is frozen first is consumed first. This makes it easier to ensure that milk that is expressed first is used first, helping to minimize spoilage. Medela has built a name for itself as a nursing mom's favorite brand. The Medela breast milk storage bags have a no-leak, easy-to-close zipper top and a stand up bottom, making pumping, freezing, thawing and pouring easier. They also are BPA-free and have a protective oxygen barrier. If you are looking for reusable containers, this Medela bottles-bags combo gets plenty of rave reviews. Dr. Brown's breast milk, self-standing bags feature a leak-proof double zipper seal to ensure none of your precious breast milk is lost. A labeling area and measurement marks help you track how much milk you are expressing and how much of this your baby is taking. AVENT breast milk storage bags are another brand that make the coveted list. A secure double zipper ensures that the bags are leak proof. They are BPA-free and are self-standing. Plus, a wide neck makes it easier to fill and pour without losing precious drops of milk. Breast milk freezer bags are specially designed to store and freeze precious pumped breast milk. Oxygen barriers are built into the design of the bags to help preserve the taste and nutrition of the milk and to allow moms to safely store breast milk in the freezer for months. If you are planning to pump and freeze breast milk, do so carefully to protect your child's nutrition. First, freeze in small amounts, such as 3 Oz in a bag, to ensure that your baby will use all that you thaw. Be sure to thaw the oldest milk first, and make sure baby takes what you thaw within 24 hours. Breast milk can be stored frozen for 3 to 6 months in a regular freezer and 6 to 12 months in a deep freeze.